Finally, a finish! I tend to work in cycles where I work on lots of WIPs then finish them all at once, and this week was full of finishes. 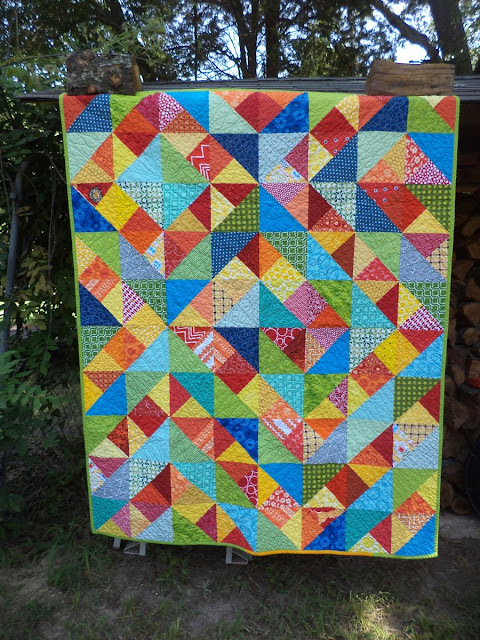 First up is this bright and happy quilt from the NURTURE circle of do. Good Stitches. This blocks is called a Four Patch Charm Square, you can find my tutorial and links to the original here if you are interested. I am thrilled to say that this is the first quilt my group has made which will go to Covered in Love, my pet charity giving quilts to the families of patients who pass away in the hospital where I work. For quilting I did FMQ with ribbon candy-type squiggles in the cool colors and a stipple in the hot colors. The ladies in my circle did a great job getting their blocks done right and quickly. It's amazing how a quilt made by 10 people can look so cohesive. The quilt finished at 50"x62". 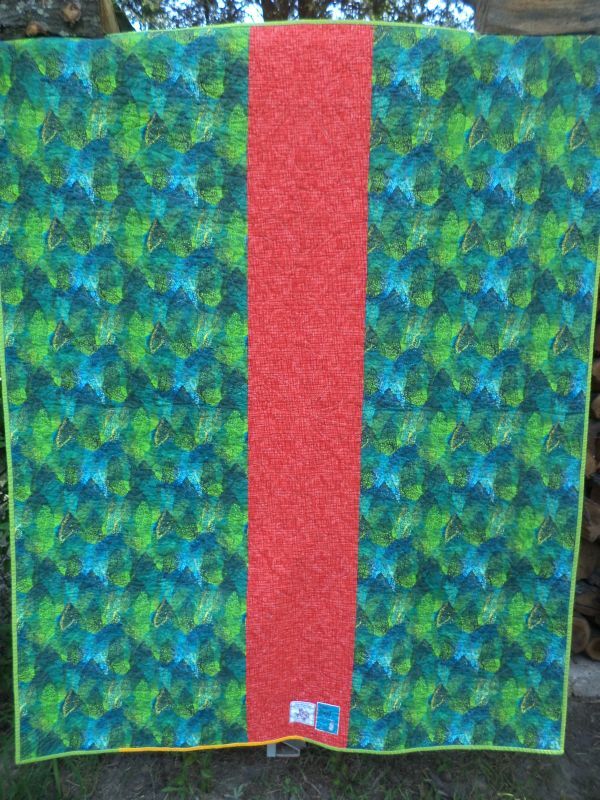 For backing I used a really bright blue-green print that looks like coral and a strip of bright red. 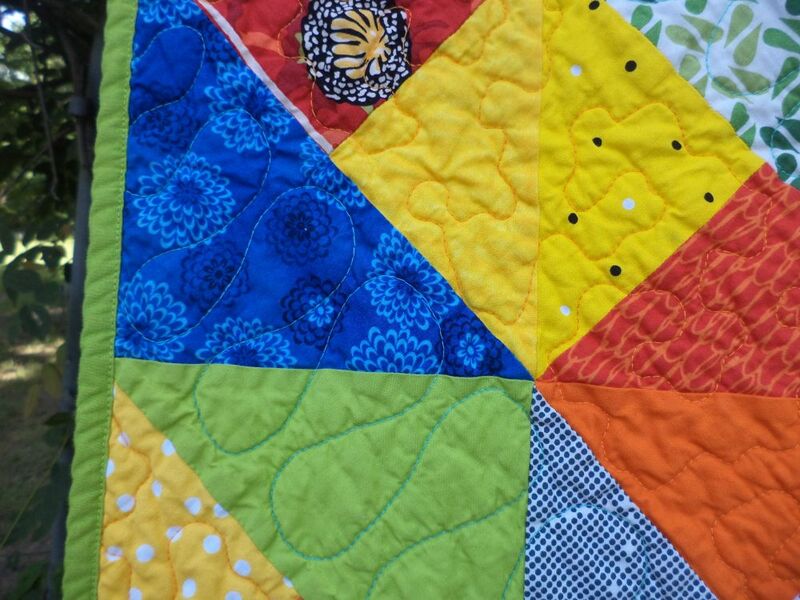 Binding is a crisp, sort of sour-apple green, except for one strip of yellow where I ran out. So satisfying to see both those label sewn on together. Thank you to the NURTURE circle ladies for supporting Covered in Love, I promise these quilts will be well used. 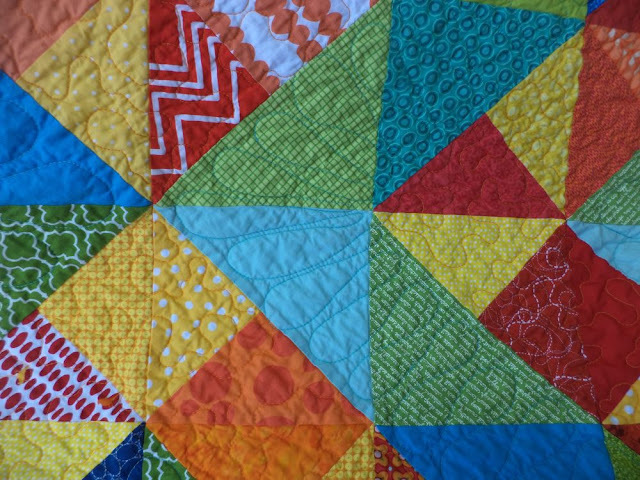 Linking to CrazyMomQuilts Finish it Friday. Congrats on your finish and on the great job everyone did on the blocks! Oh, dear Kat! I've just read about your project! How much sadness you see every day! You gave me food for thought. I will find a way to participate in your project even the distance separates us so much. Now I understand the inner need to surround yourself and others with the quilts beauty . I admire your energy and I'm really honored to know you. 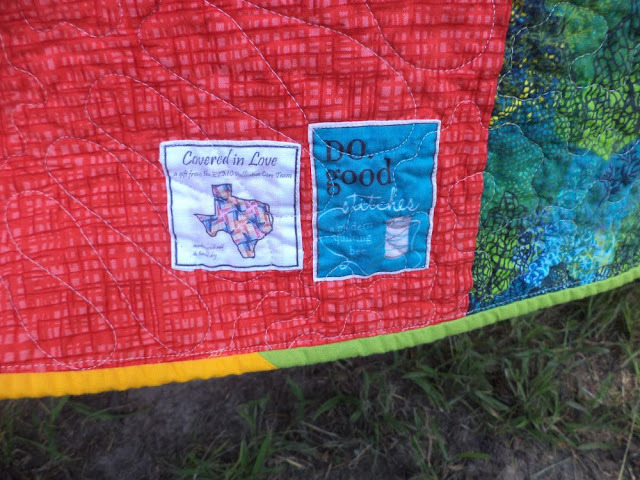 Your group quilt is awesome and yes, is hard to believe that so many hands worked on it! A warm hug for you, Big Hearts! I love the direction your quilt takes my eye, it reminds me of the stereograms that were so popular decade a go. Great colors!